Creators around the world are sharing their videos on Facebook to build a community around their passion — whether their passion is comedy sketches, their favorite recipes, or even knitting sweaters. On Facebook, creators can connect with more than two billion potential fans and collaborators, get to know their community, talk directly to fans with Live, and monetize with products like branded content. We understand that creators have specific needs, and we’re committed to helping them on their journey as they grow and find their community. 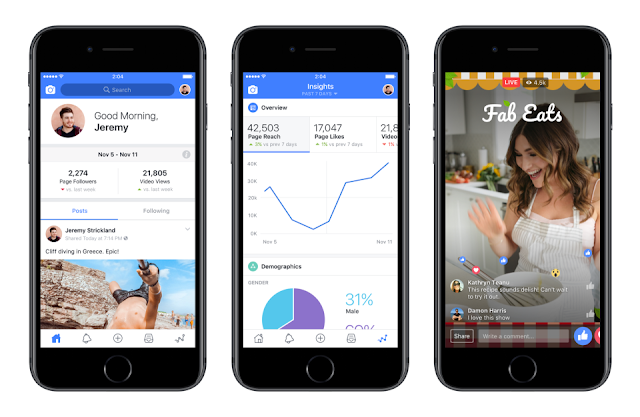 As part of this commitment, we’re announcing two initiatives to help creators unleash their creativity: an app that helps creators manage their presence on Facebook and a central destination where creators can get the resources they need to improve and grow.